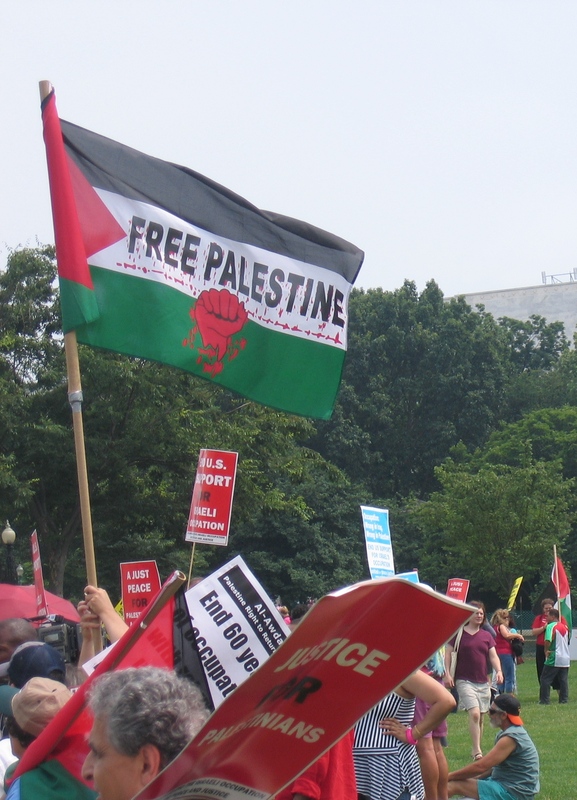 Protestors gathered on Capitol Hill this past Sunday to express their disapproval of U.S.-supported Israeli occupation of Palestine, an occupation that now exceeds 40 years. A small but diverse and lively crowd, the protestors collectively argued for adherence to applicable U.N. resolutions and international law, protection of Palestinians’ individual human rights and cultural right to self-determination, and the restoration of justice as a practical means of achieving peace. On the other side of 3rd Street, a counterdemonstration of about 50 “pro-Israel” protestors gathered to express their disagreement. Oddly, these protestors argued for the same abstract principles as their counterparts up on the hill. They claimed to be on the side of peace, supporting democratic values and human rights, and their chief argument centered on denouncing violence and terrorism. Both groups of protestors allege that truth and moral high-ground was on their side, exclusively. If two groups of people, so diametrically divided over something, forthrightly espouse the same interests, then how can there be conflict? The conflict, as I understand it, is preordained simply because only one truthful and accurate historical record exists. Each argument, however, employs its own version of history, allowing each to claim fundamental superiority over the other, and on the same ostensible pretenses of justice. Either selective ignorance of historical events or outright dishonesty is at work in one (or both?) of these arguments. An open-minded and independent review of history is necessary in order to responsibly choose a side. While my personal bias is unabashedly on the side of the Palestinians, I feel these talking points are worthy of examination from any angle. Recognize that as Americans, our culture is not neutral on this issue, that outside the United States and Israel, there is widespread disapproval of Israel’s human rights record, and that this is not a politically contentious issue in the international arena, where violations of international law affect political causes negatively. Since the invasion of Iraq, I’ve argued that the Bush doctrine, specifically the invasion of Iraq, has radicalized Muslim extremists and increased America’s vulnerability to terrorism. What’s even more damning, still, is this administration’s willingness to risk the lives of millions of Americans to gain strategic influence in the Middle East and control over Iraq’s vast oil reserves. 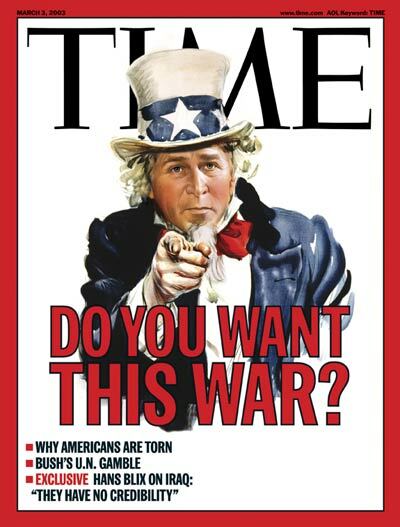 Prior to the invasion, the Bush administration knew that a military action against Iraq would spark a Jihadist Renaissance; they ignored this threat. Moreover, bellicose rhetoric or action against Iran will have the same effect there, as the 9/11 attacks had here. After the attack on America, Americans united around Bush. If half of us didn’t support Bush before 9/11, the attacks forced us to rally around our President; after all, he was all we had. We trusted President Bush to protect us from the threat of terror. Who else could we have turned to? Many Americans enlisted in the army and our government promised to avenge the deaths of 3,000 innocent Americans. If we ever hope to reduce or even eliminate terror we must, as Noam Chomsky has argued, stop participating in it. We have to pull out of Iraq. We have to negotiate with Iran and Syria. We have to reassess our blind support for Israel. We have to place the security of our people ahead of economic or strategic ambition. Last November, former president Jimmy Carter published a book appealing for a peaceful resolution to the violent conflict between Israel and its Arab neighbors entitled: Palestine: Peace not Apartheid. Unique and unprecedented, this book offers its reader a perspective that seldom receives public attention. Jimmy Carter accounts his personal experiences and involvement with influential leaders of several Middle Eastern countries. Numerous historical events that oftentimes are foggy or shrouded in the American Public’s general understanding are discussed openly. Carter draws from his first hand knowledge, and, to an extent rarely seen in mainstream literature, implicitly acknowledges the humanity of all peoples affected by this conflict. On the whole, I found the book very easy to read, thorough and intensely candid, and apparently written with the understanding that it broaches a subject frequently abused on those rare occasions it is actually discussed. It was, unfortunately, encumbered with a religious facet that I felt diminished its scholarly value. Stemming from Carter’s forthright and non-biased disclosures is the unsurprising consequence of passion-driven personal assaults against the president’s character. Carter’s work has, unfortunately, been interpreted by many as nothing more than an unfounded attack against Israel, sympathetic to the cause of violent fanatics who are intolerant of a Jewish state, and unruly diplomatic behavior unbecoming of a former U.S. president. The most heated criticism against Carter’s book is his describing Israel’s treatment of non-Jewish inhabitants in the occupied territories as apartheid. Responses in defense of Israel’s treatment have been swift and strong; critics denounced the comparison of Israel to South Africa as absurd, claiming that Carter’s doing so compromises his credibility. If the comparison is inappropriate, then Carter should be commended for clearly agreeing. The final chapter of the book, the one most bitterly unwelcome for its apartheid analogy, says in its second paragraph that “the driving purpose for the forced separation of the two peoples is unlike that in South Africa,” (pg. 189) then acknowledging the difference between Israel’s and South Africa’s respective motives. 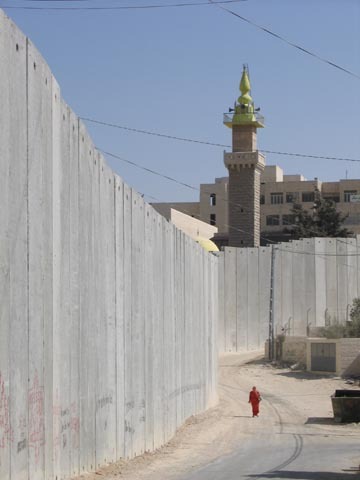 The analogy, it is important to understand, is based not upon motive, but upon method; to the extent that the analogy is informative and accurate, Carter beseeches the reader to consider critically the reality of Israeli/Palestinian apartheid and its caustic social effects on the marginalized people so affected. Another recurring claim from Carter’s critics is that he attributes blame for the region’s instability exclusively to the Israelis, a critique that is simply untrue. As a matter of convention, President Carter links the diminishing prospects for peace with those individuals who, through the employment of sectarian violence, routinely derail collective efforts to establish such a peace, and he notes that these activities are not specific to any religion or ethnicity but are observable in a small, fanatical portion of each. Carter never espouses the use of violence taken by some Palestinians as a means of conflict resolution. Early in the book, in fact, Carter expresses in plain English that some Palestinians respond to Israeli occupation by attacking Israeli civilians, describing such behavior as “morally reprehensible and politically counterproductive” (pg. 15). He revisits, as necessary, this sort of criticality of the Palestinians throughout his book while apportioning similar criticism to Israeli politics and behavior with greater frequency, a style I did not find inappropriate considering how underrepresented the latter is in the literature that our culture is accustomed to seeing. Implicit but clear, Carter’s overarching conclusion from reviewing the historical record and assessing the present state of affairs is that baseless aggression, originating from sentiments reducible to mere hate, fear, intolerance, and ignorance, will deter efforts toward peace, independent of which side that aggression comes from, and it certainly comes from both. Carter deplores the inclusion of violence in any stratagem that aims for stability and identifies the process as inherently counterproductive, a standard that some Israeli sympathizers, it appears, find unpalatable when applied not strictly to the oppressed, but when applied to themselves, as well. The final oft-heard shot against President Carter I will address is his highly publicized refusal to debate the Israel/Palestinian conflict with Alan Dershowitz. Considered by many to be a leading scholar and an authority on Israel’s history and politics, Alan Dershowitz, a law professor of Harvard University, was Brandeis University’s choice to debate Jimmy Carter after the president accepted an invitation to lecture there. Carter declined the offer to debate Dershowitz, expressing that he had no inclination to converse with a man who “knows nothing about the situation in Palestine”. Although this chain of events has evoked varied analyses of Carter’s motives and merits, I find it unfair to discount him solely because of whom he will and will not talk to. A man who insults the memory of a deceased holocaust survivor, accusing her of Nazi collaboration, simply because her son writes books exposing his plagiarism and scholarly misconduct is not a man I’d like to debate with either. These and many other criticisms of the book and its author fail to acknowledge the simple problem called to attention by President Carter. His nerve to bluntly express the plain and obvious has made him a target. The sharpest criticisms that his work has drawn are concerned not with the social issues of its focus, they are concerned with savagely bludgeoning his credibility, a dialogical vector that, I believe, has as much productive potential as the six years of dialogical silence that the author scrutinizes. Understanding the chronic tension between the Israelis and the Palestinians requires a clear-eyed assessment of affairs in which one’s predispositions and biases are suspended. It is a remarkable failure of precisely this sort of suspension that characterizes this new book’s media-hype comet-trail. Although Carter offers as factual an account of his own involvement as he is realistically able to narrate in a single volume, attempting to cover broad topics extensively but concisely, the over-emphasized response it has generated, which comes mostly from Israel-sympathizers, condemn Carter for his audacity to express things in conflict with their ideology. The Associated Press is reporting that “Palestinian gunmen killed three young sons of a senior Palestinian intelligence officer Monday, pumping dozens of bullets into their car as it passed through a street crowded with schoolchildren in an apparent botched assassination attempt that could ignite widespread factional fighting.” The boys’ father, Baha Balousheh, “a Fatah member, was a lead interrogator in a crackdown on Hamas a decade ago.” Fatah members suspect that Hamas is behind the murders, although the group denies any involvement. The car was soaked in blood. A child’s backpack, emblazoned with cartoon characters and the word ”Friend,” lay on the front seat, covered in blood. Another schoolbag was in the back. Four more people were wounded in the attack on Palestine Street, which is lined with nine schools. The attack sent children in the area running for cover, some dropped to the ground, others fled in panic. According to the Israeli human rights group B’Tselem, 801 Palestinian minors have been killed by the IDF in the occupied territories; two died in Israel. I’m not aware of any American reporters who have extended Palestinian casualties of Israeli aggression the space, detail and ‘human impact’ they deserve. (If Israel were the aggressor, this report would never fly.) But the above serves the needs of American policy: the sectarian nature of the attack exemplifies the disunity of Palestinian government, Fatah, America’s ally, is portrayed as a victim of Hamas aggression and Hamas is presented as a criminal entity. This meets American policy objectives. The UN Human Rights Council “voted 32-1 with 14 abstentions to declare illegal Israel’s 1981 annexation of the Golan Heights and demand that Israel rescind its decision to impose its laws and jurisdiction on the area, which it captured in the 1967 Middle East war.” In reporting on this story the Associated Press, like the Washington Post, couldn’t help but echo the official Washington line. The AP made no mention of Israel’s egregious human rights record and instead attempted to suggest, twice in its article, that the council unfairly focused on Israel and not on traditional American enemies, whose records are ripe for review. Again, the outrage, as it was expressed by the AP, reflects the belief that US allies are beyond the reach of law, no matter their actual violations, while US adversaries are fair game. Thus the quality of one’s human rights record is determined by one’s proximity to the global super power. The AP dismissed the resolution as preposterous, without even pretending to review the record, (unnecessary given the operating doctrine stated above) and suggested that at least in the Golan Heights, Syrians are enjoying a booming economy. According to the Israeli Ambassador to international offices in Geneva, Itzhak Levanon “Under Syrian possession, the Golan Heights were used to launch constant attacks against Israeli civilians,” Levanon said. “Today, the Golan Heights is more peaceful than ever, stable and thriving. The economy is booming, fields are blossoming, and everyone is enjoying the benefits of democracy.” The AP digests these comments at face value, without quoting a single Palestinian source. Again, the conventional wisdom states that Israel is targeted not because of its record, which does not even merit review, but because of its status as a Jewish state. Here again, we are eager to exploit and manipulate the history of anti-Semitism in order to silence international criticism of state action. These are the kinds of stories which pass for ‘reporting.’ The media, Washington, Israeli PR firms establish a framework which negates any need for intellectual thought, investigation or critical analysis. So when it comes to Israel, power speaks; our media reports.